This is part 5 of a series photographing grain elevators in Manitoba (part 1, part 2, part 3, part 4, summary). Leaving Rivers, I headed toward the former CP Lenore subdivision. 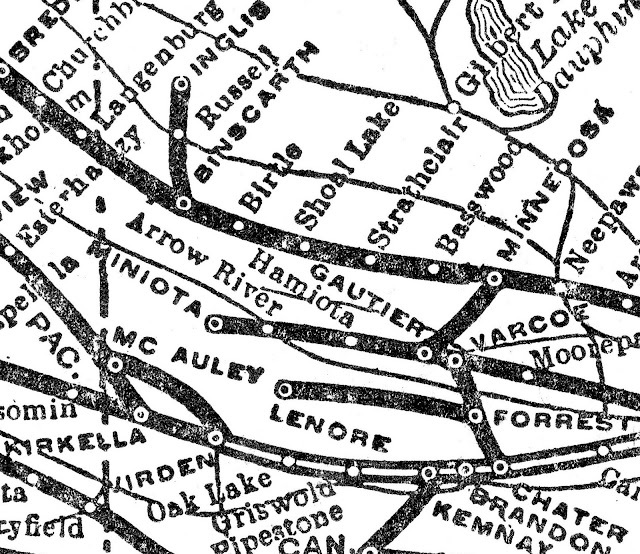 This subdivision was one of those prairie branch lines that didn't make a lot of sense, being parallel to the CP Carberry subdivision and the CP Miniota subdivision, never mind the nearby CN lines. The Lenore sub was shortened in 1977 and was abandoned soon afterward. I wrote about the start of the Lenore sub at Forrest here. 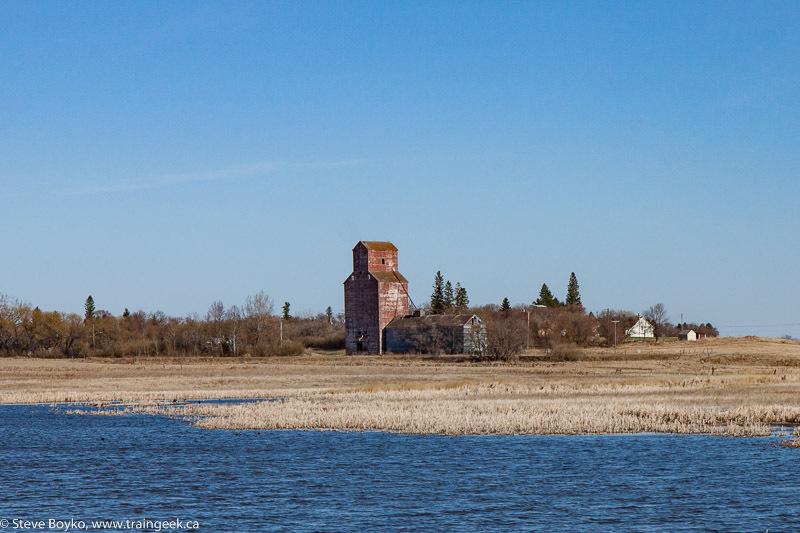 The grain elevator in Bradwardine is still in use, despite not having rail access for the past 25 years. I could hear machinery working and in fact there was a truck in the elevator's driveway. Numerous bins stand on the other side of the former railway right-of-way. You can see from the photo above and the distance shot below that various parts of the elevator have been replaced with metal siding. I didn't linger too long, and I didn't want to approach too closely since it was clearly still in use. I moved on toward Lenore, the end of the former subdivision. The elevator at Lenore looks a lot like the Bradwardine one, except that it has a horizontal annex rather than a vertical one. Lenore was Manitoba Pool #40. 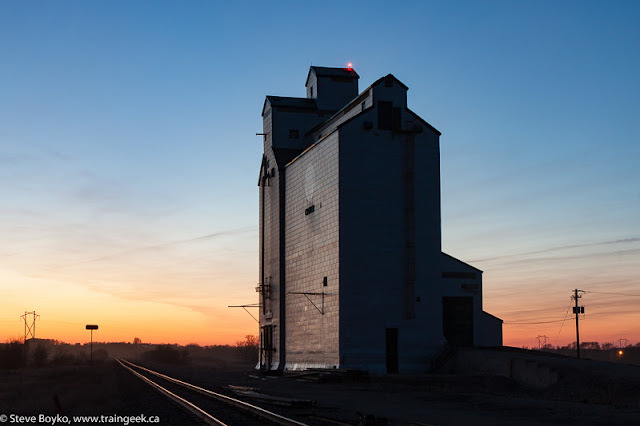 I'm not sure if Lenore is still in use or not - this Flickr photo seems to indicate that it is - there is a fence around the "track" side of the elevator that is clearly meant to discourage people from wandering over there. My photos are from the road side. You can see that the driveway has been rebuilt with modern siding but the rest of the elevator and annex appears to be original. I was able to walk up to the original railway right-of-way and take the below photo without crossing any fences. While shooting the elevator, I was distracted by a tree full of birds. Now I really had to do some criss-crossing to get the remainder of the elevators. First I had to drive down to near Virden to get the Harmsworth elevator. 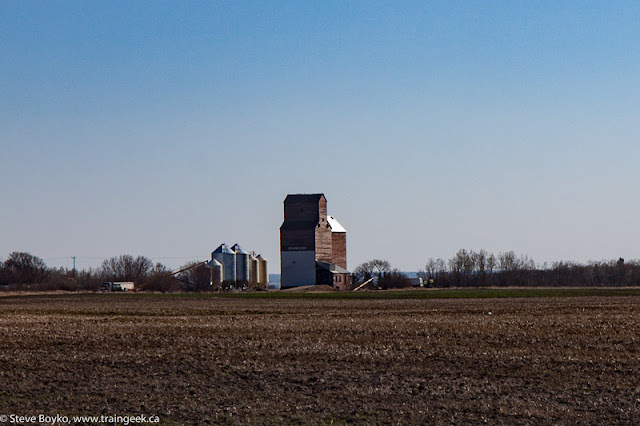 En route I passed right by the Virden-Hargrave elevator. 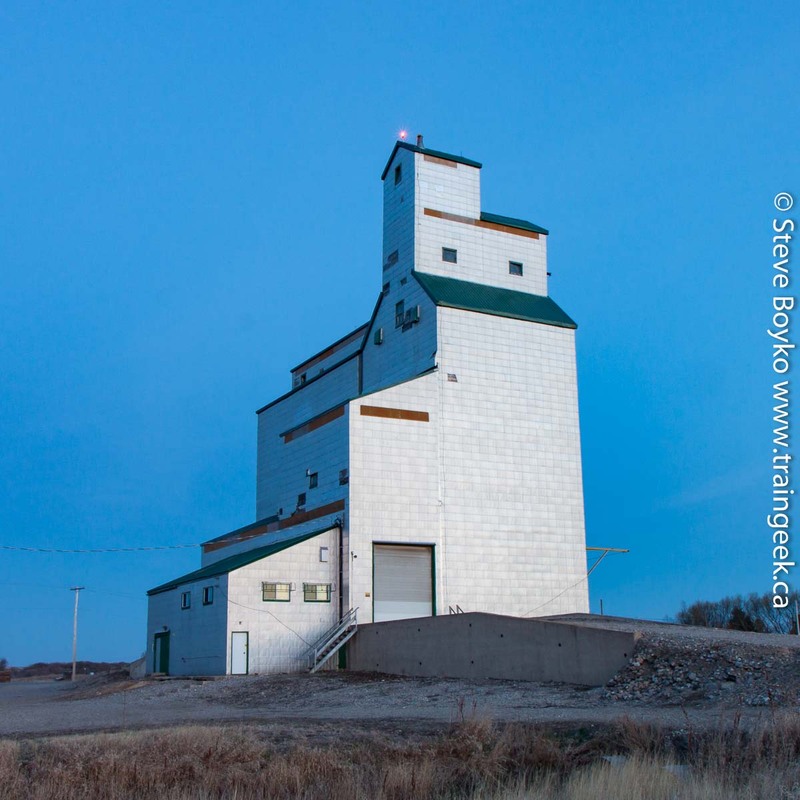 This elevator was not actually new to me, as I had photographed it last summer during a trip to Saskatchewan. However, I was here, so... grab a photo and carry on. Before you ask, I have only a faint idea why it says Virden Hargrave on the side. 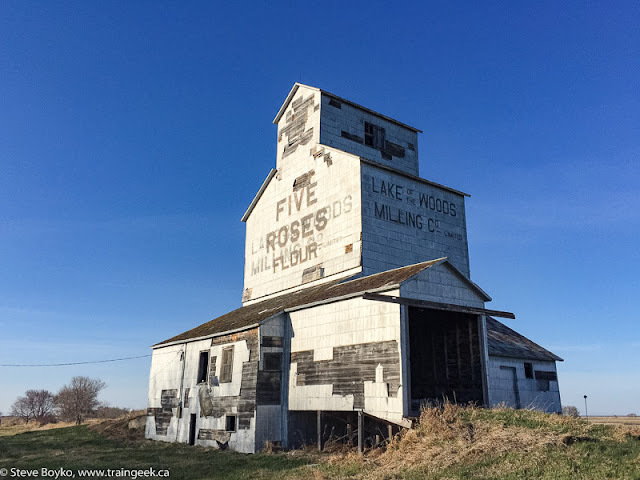 It's clearly an ex Manitoba Pool elevator, but it's not in Virden nor in Hargrave. I guess it's near both of those. It's adjacent to the CP Rocanville subdivision but it has no rail service. 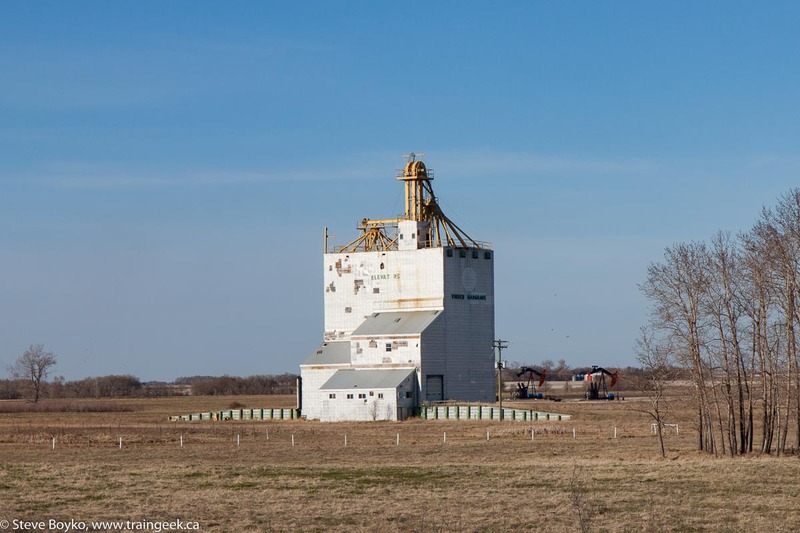 The grain elevator "in" Harmsworth is amongst the oldest remaining elevators in Manitoba. 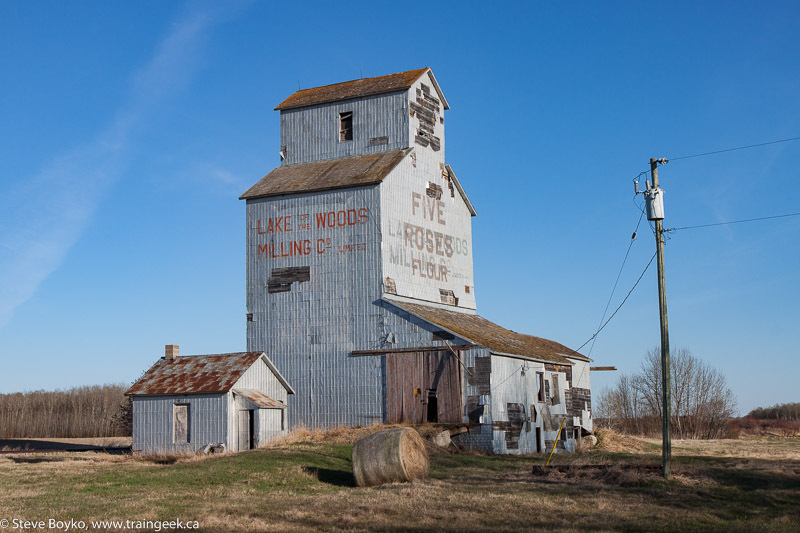 I'm pretty sure the Elva Lake of the Woods elevator is older but this one is not much newer. Despite its appearance, this elevator is still in use. 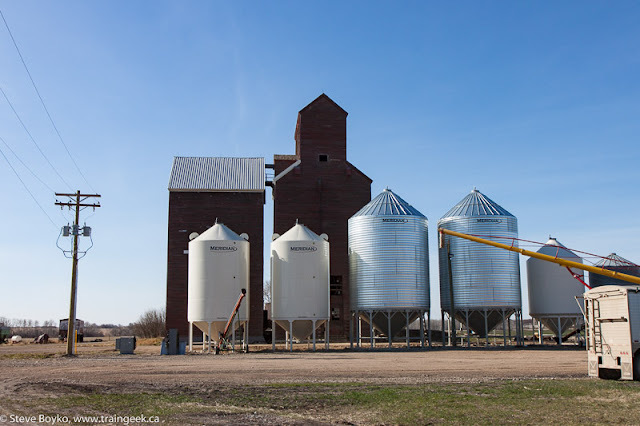 I met the owner of the elevator while I was photographing it, and he told me that there was some grain stored in it. He's quite concerned about vandalism and said that it has been vandalized twice recently. As a result, he keeps a close eye on the elevator. We had a good chat, but alas, I had to carry on before the sun set. 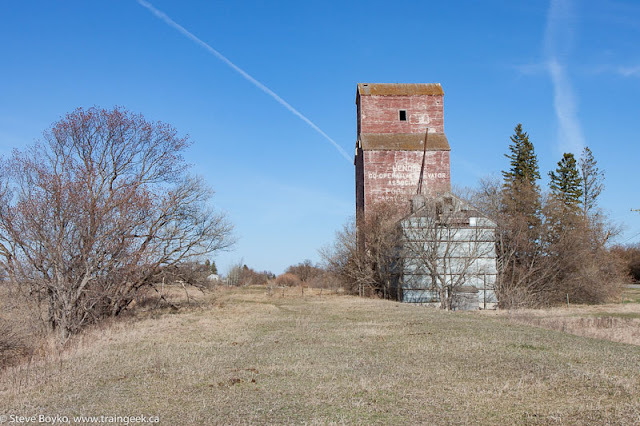 This elevator is also adjacent to the CP Rocanville subdivision but obviously has no rail service. From Harmsworth it was another long drive up to the CN Rivers subdivision again, this time at Quadra. The elevator at Quadra is privately owned and apparently still in use. 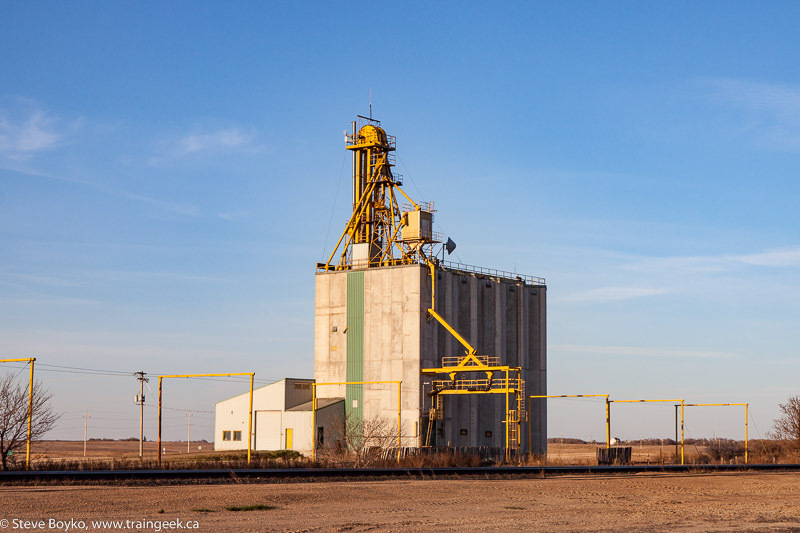 It is a former Viterra concrete elevator with a capacity of 5,450 tonnes. There are two tracks off the CN Rivers subdivision. The elevator was (is?) listed in CN's Producer Car Loader Station List with 7 car spots. There is a lovely bend in the track between Quadra and nearby Arrow River that a few people have photographed trains at. I hung around for a bit but there was no sign of any train nor any green signals to be seen. Here's Bill Hooper's photo at Quadra from 2003 that includes the older Manitoba Pool elevator. I think the current elevator is behind the wooden one. I went over to Arrow River and looked down the track there, too. 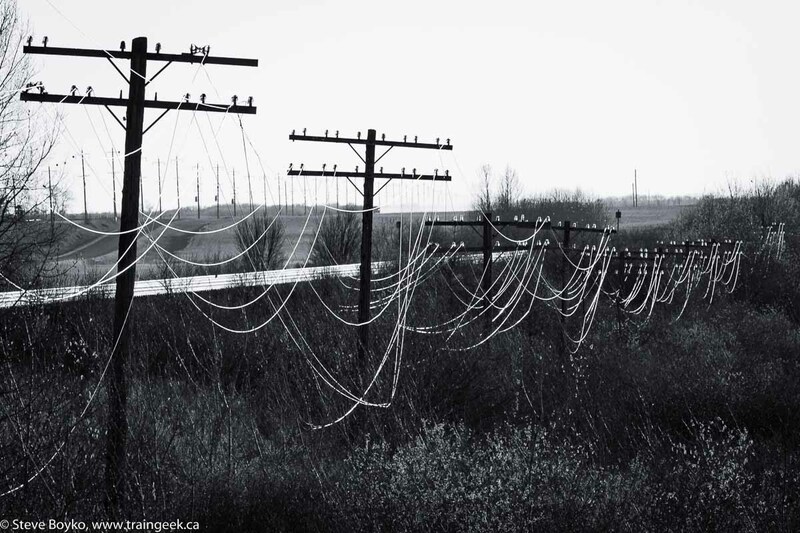 Nothing but some sagging but picturesque telegraph wire. On to Cromer in the falling dark! 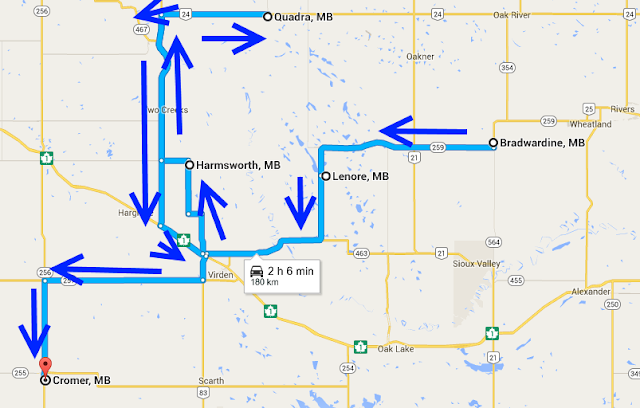 I had to hop on the Trans-Canada Highway again for a few minutes, then headed down route 256. On the way I took a few sunset photos. 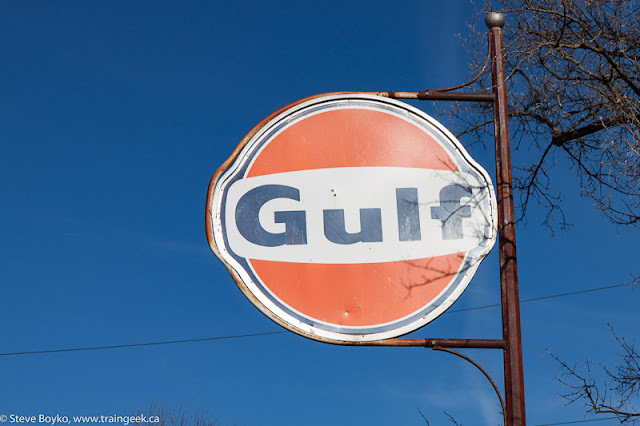 You can tell I was getting into oil country! Cromer was the last elevator on my list. I knew from the start that I would get to Cromer after the sun set, so I was prepared to set up the tripod and take some long exposure photos. I like the results so much that I am sorely tempted to revisit some elevators after dark! 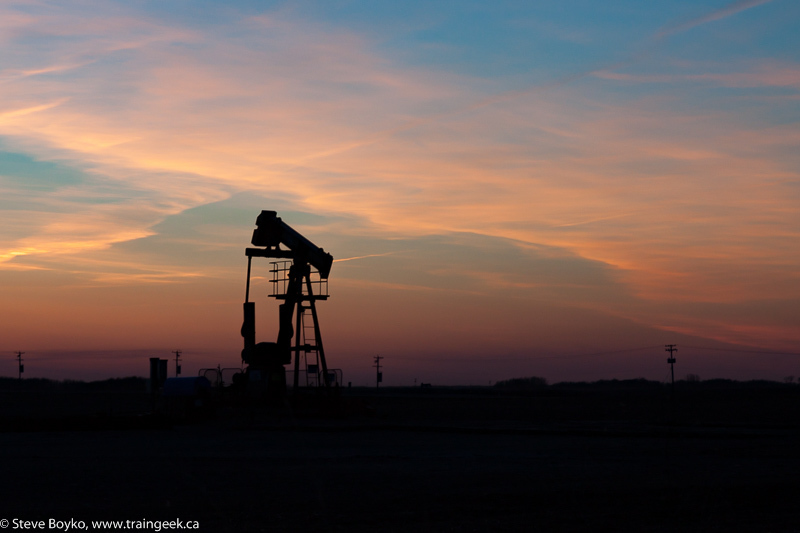 Cromer is smack dab in oil / fracking territory, and in fact I drove through a large terminal operated by Tundra. This large terminal is capable of handling 60,000 barrels per day and is serviced by CN via the CN Cromer subdivision (surprise!) The new rail facility is several kilometres east of the elevator and has two loading tracks and a couple of storage tracks, as far as I can see from Google Maps. Cando has the contract to switch this facility and has two locomotives there. After Cromer, there was nothing left to do but head home. I'll wrap it up in the next post. Thanks for reading along! I thought you would of taken a picture of a trail of former railbed in Kenton. I walked on it a few times as a kid when my Grandparents lived in Kenton. 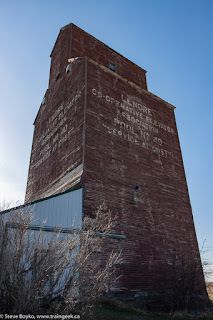 I seem to recall the elevator in Kenton was knocked down in 1988 or thereabouts. 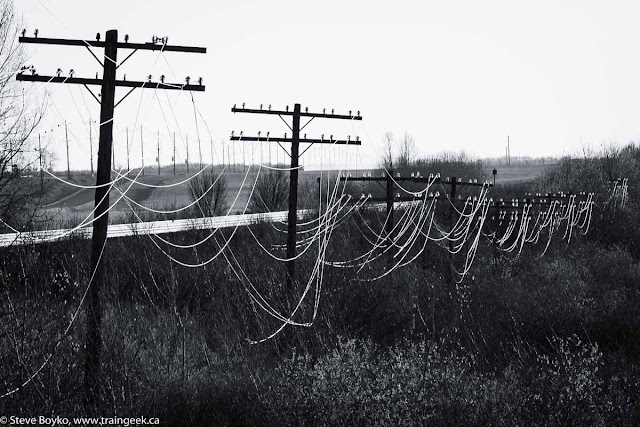 Of note, in Brandon for the last couple of weeks, CN 1400 has been doing the switching. It sure has a LOUD horn. Hi Anonymous, sorry, I drove right by Kenton - no elevator, no stop this time! Glad to hear a few GMD1s are still hard at work. The Kenton Pool elevator was moved to Quadra to join the newly finished concrete elevator there in 1980.